for once google was not my friend. I couldn't find a good website for what I was looking for. If I want to go to 2 or 3 LA subway stations just for some photography, which ones would you suggest? Which are most photogenic, have the most or best art or whatever else may be of interest? I used to take a lot of train and station photos (and photos of many other things). My personal favorite was always Vermont/Santa Monica, but I think the subtle etching-in-stone effect appealed more to the eye than it would to the camera lens. If I could photograph only one, I think I'd head for Hollywood/Highland. Your camera also might appreciate the murals on the Universal City metro platform, and a visit to the North Hollywood station. They're all unique as far as artwork goes. Unions station has some of the best opportunities because it's a real station. To find photos of LA stations and trains try nycsubway.org and go to the part where they have other systems. Be prepared to have to explain what you are doing to both employees and sheriffs. Some may tell you that it's not allowed but of course it is. I got a ticket a few years ago but hopefully it's gotten better. Wilshire/Vermont is the one I took a ton of pics of when I first visited b/c of how massive it is and that it gives off the sense of being a major transit hub (which it is). 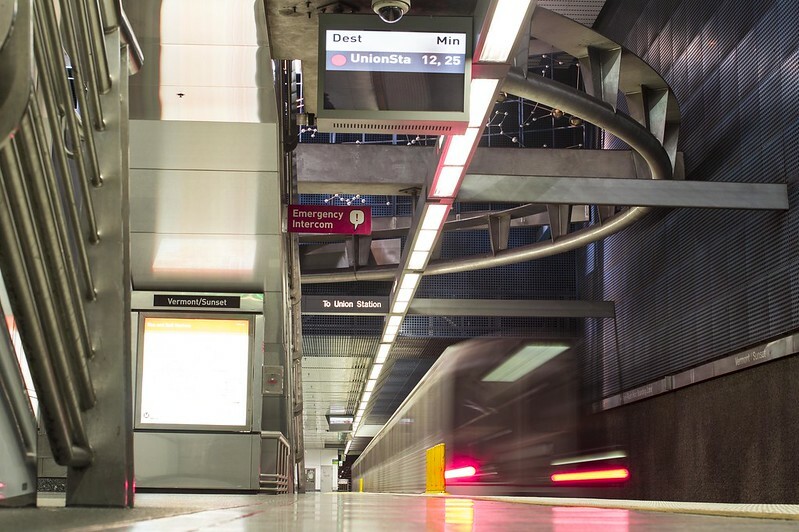 LA has had subway stations for the last 25 years. Anybody that is unaware must be living under a rock. If you want reasonably crowded platforms and trains, the upper level of Seventh Street/ Metro Center is good. I'll link to a couple of photos I've taken later today. The available space on this platform is less than on the lower level platforms, so the degree of crowding is worse. Last edited by Those Who Squirm; 03-20-2016 at 06:01 PM..